On March 21st we’ll be running in the Philadelphia Get Your Rear in Gear 5K. The run travels along scenic West River Drive and recognizes survivors and honors those we have lost to colon and rectal cancer. I am running the race in memory of my Grandpa Byma who passed away from colon cancer when I was in second grade. 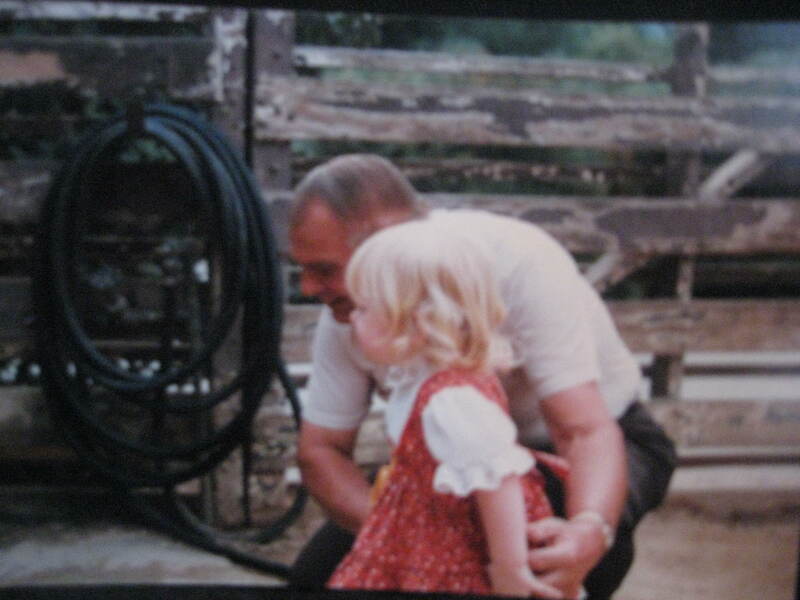 I was young when my grandpa died and yet I have some great memories of him from when I was little. We loved spending time with him in the backyard by the pepper tree. And I have my grandpa to thank for my addiction to candy corn. You see, he didn’t just have candy corn at Halloween, he had candy corn for us year round. Whenever we went over to my grandparents house I can remember waiting to get to go with Grandpa to his office for the sacred candy corn. The candy corn was stored in a box in the top drawer (where our little hands couldn’t reach on our own) of his filing cabinet. He would open the drawer and take out two or three candy corn for each of us. Twenty years later every time I eat candy corn I am reminded of Grandpa. Funds raised will help local efforts to raise awareness of colon and rectal cancer and positively impact screening rates. According to thefreedictionary.com crazy means, “Affected with madness; insane” or “Foolish or impractical; senseless.” And those definitions could definitely be used to describe our run this afternoon. The temps were in the low 30’s and it was sleeting and yet Kim, Sara and I set out for our weekly Monday run. The good news is that according to the training schedule we only needed to run two miles, but still it seemed “foolish or impractical” to be running outdoors down Kelly Drive. But, if you look closer at the rest of the definition there are two more definitions that I think are more suitable for defining our run this afternoon. Sure, the run could be considered crazy but only because it was, “ Possessed by enthusiasm or excitement” and we were, “ Intensely involved or preoccupied.” That’s how I would rather define our run, as a passionate run because we are so committed to training. Either way you define the run I was struck by a thought as we ran alongside the Schuylkill River. What if I was as dedicated to the other areas of my life as we are to training for all of these races. Rain, sun, snow, cold, it doesn’t matter, we stick to our schedule and train. What if I approached my graduate school homework that same way? What if I approached my Thirty-One business with that same passion, enthusiasm and intensity? Those are big what if questions but I think I might take the time this week to answer them because I think the potential outcomes could be pretty amazing. I love the Olympics. There is really no other way to describe my affair with the Olympics except to say that I am head over heels in love. I love watching the personal stories, the events, the medal ceremonies and all the seemingly insignificant details in between. This week while I was watching down hill skiing there was a commercial (as an added note, I love the Olympic commercials as much as I love the Olympics) for the Olympic soundtrack. And that is when I discovered my new soundtrack for the running endeavor we embarked on this year. This song is a great reminder that despite all of the obstacles (cold weather, travel, being sick) we are going to be able to reach our goals and run all of these races. Check out the lyrics and if you’re able I would definitely recommend downloading a copy of the song and adding it to your workout playlist. I run to develop lifelong healthy habits…I was reading an interview today with Bill Clinton in which he explained why he needed his small heart procedure last week. During the interview he said “The root causes were the habits I acquired in my childhood.” While I am past my childhood I want to make sure that I am continually developing healthy lifelong habits. I run to challenge myself…I am a goal oriented person. Having a goal in front of me keeps me motivated and on track. Setting running goals has helped me move towards my goal of maintaining a healthy lifestyle. Last week was a difficult week of training for me. Between our two blizzards here in Philadelphia and a quick weekend trip home to California I found it difficult to stay on the training schedule. BUT, this is a new week which means I get a fresh start and there are a couple of things motivating me this week to continue training for these races. The first is the encouragement of girls. When I get a text from Cecily about reaching new milestones, or have a conversation with Sara about continuing with training even when it’s been difficult I am reminded that we can do this together. There will be days and weeks when I want to take a break but we’re in this journey together and I am confident that we will continue to keep pushing each other to reach our goals. I can not imagine what it would be like to take on a challenge of this many races in a year and do it all on my own. The second is knowing that pushing through the difficult times will get me to the goal. When we are crossing the finish line of our first race the difficult days of training will be behind us and replaced with such a sense of accomplishment. I’m excited to cross the finish line and that excitement is what will propel me through the days of training this week. This past week Philadelphia was buried beneath not one, but two blizzards! Being snowed in made it difficult to keep on track with our training schedule so by the time we dug out on Friday I was ready to get back on track with training. Friday was another snow day from work so I set out Friday morning for a three-mile run and discovered that this was not going to be an easy run. 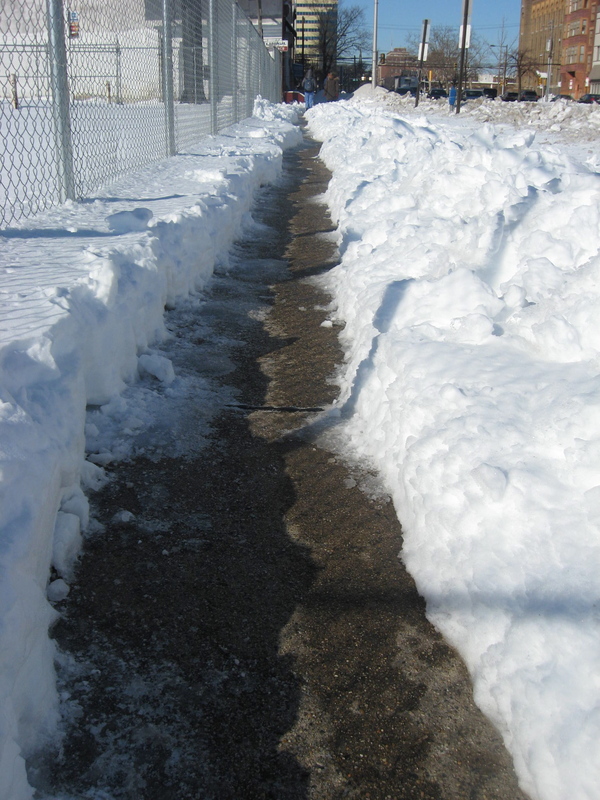 My running path included traveling over snow piles, across barely shoveled sidewalks, and trying to avoid icy patches. Staying upright throughout the run was challenging but I kept reminding myself that if I can run through these conditions, come race day I’ll be ready to go. And then I boarded a plane to head home to California…and what a difference a plane ride makes! When I woke up this morning and headed out for my morning run it was a different story. For starters rather than don layer upon layer of clothes and then adding earmuffs and gloves to stay warm, I set off running in just shorts and a t-shirt! 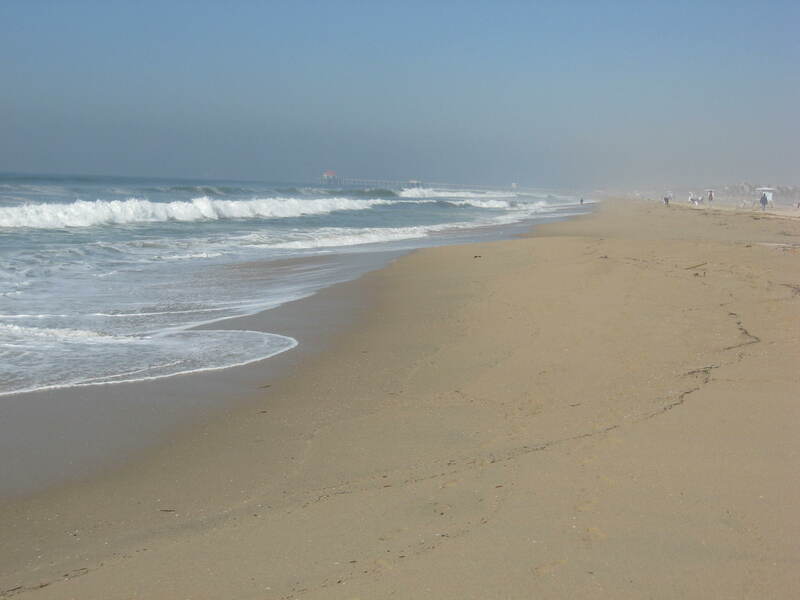 And today’s running path included watching the waves crash onto the sand and relishing in the 75 degree temperatures. On Monday I’ll head back to Philadelphia and training in the cold, but for today I enjoyed this beautiful run. As this training journey continues I have found that I will need to research ways to stay hydrated while I travel…any suggestions are appreciated. 2009 was a difficult year for me health wise including a couple of surgeries and time spent in the hospital at the end of the year because air was leaking out of my airways. So in January my New Year’s resolution was to have 2010 be a healthier year for me. I joined a great Twitter challenge (thanks #10in10) to help keep me on track but I knew that wasn’t enough. I knew that for 2010 to be healthier I would need a support system…and that’s where my amazing friends come in. All five of us volunteer together in downtown Philadelphia at the Helping Hands Rescue Mission and as our friendships have moved beyond the Mission they have also grown and deepened. So at the beginning of the year we decided that we wanted to run a 5K together at the end of March. We all committed to training for different reasons, but we’ve committed to doing this together. Kim has taken this on as a personal change to show herself that she can consistently train. Anna is excited that since we’ve begun training she has worked up to being able to run 1 1/3 miles straight..something she had never done before! Cecily didn’t think her body was capable of doing something like this and so she committed to training to push her body to do something she didn’t think she could do. Sara needed to make a change in her lifestyle habits becoming healthier as she has a history of cancer in her family. And so our training begun. And training with friends has made it so much better! In fact we have enjoyed training so much that we have made a list of races, including a 10-mile run in Philly, a 10K race this summer, a 5K in NYC this fall and a half-marathon in LA in October, that we are challenging ourselves to compete in this year. How amazing will it be at the end of the year when we can say that we know we are taking the best possible care of our bodies…and that we’ve done it together! And so this is a chance to share our journey with others…our journey as we run in below freezing temperatures, log hundreds of training miles, travel the country to different races and strengthen our friendships.